Get some cultural insight at Galleria S.Eufemia and Giudecca 795 Art Gallery. Do your shopping at L'artista della barbaria and Casa dei Tre Oci. 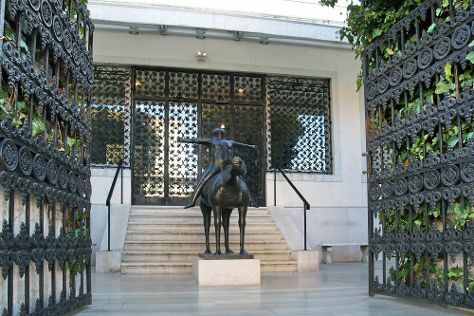 The adventure continues: steep yourself in history at Peggy Guggenheim Collection, shop like a local with Bel-Air Fine Art, view the masterpieces at European Cultural Centre - Palazzo Mora, and admire the striking features of Doge's Palace. To see reviews, ratings, photos, and other tourist information, you can read our Venice visit planning website . If you are flying in from Portugal, the closest major airports are Venice Marco Polo Airport, Treviso-Sant'Angelo Airport and Trieste–Friuli Venezia Giulia Airport. In March in Venice, expect temperatures between 17°C during the day and 5°C at night. Wrap up your sightseeing on the 6th (Wed) early enough to travel back home.